It’s often recognised that some of the simplest designs are the most effective, and Carddies Family One pack fits perfectly into this profile. This arts & crafts pack is supplied in a strong cardboard box that’s packed full of twelve double sided characters printed on premium card. 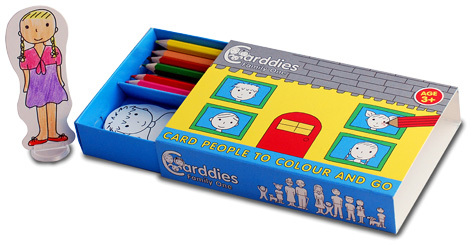 Kids can have hours of fun colouring them in with the twelve coloured pencils that are also included in the set. When they’re finished, kids simply clip them into the special plastic Carddies stands and place them wherever they want in front of the background scenery. This can also be coloured in, making each one totally unique when finished. Children love taking them around to their friend’s houses and joining two or more scenes together for loads more playtime fun! There are several different themes to choose from including fairies, knights, football, ballet and cavemen, all made in the UK. Please tell us what you think of the Carddies Family One Set by Carddies.